The most exciting aviation event is coming, and Warsaw Flying Club is going to be in the thick of the action! Whether you have a general passion for aviation, you’re a licensed pilot, or have just signed up for your first lesson, there is one summer event you can’t miss; Oshkosh 2014. Be part of the action this year and join us as we fly into the swarm of airplanes, helicopters, and ultralights at the world’s biggest airshow! 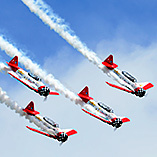 Warsaw Flying Club will be making daily trips into Oshkosh for the week long air event, July 28 through August 3. We invite you to join us for this incredible experience as we fly into the busiest, most exciting airspace in the world for just $249 for the day! This includes the round trip flight and admission to the event. These seats won’t last and space is limited. Contact Katye, katyetom@gmail.com or 574-606-5050 by July 14th to book your seat!